This eBook will help you plan your compressed air system for maximum efficiency and future flexibility. This Plant Services Compressed Air eBook will help you plan your compressed air system for maximum efficiency and flexibility, manage your hazardous waste safely, track your savings and progress, and optimize your compressed air system. 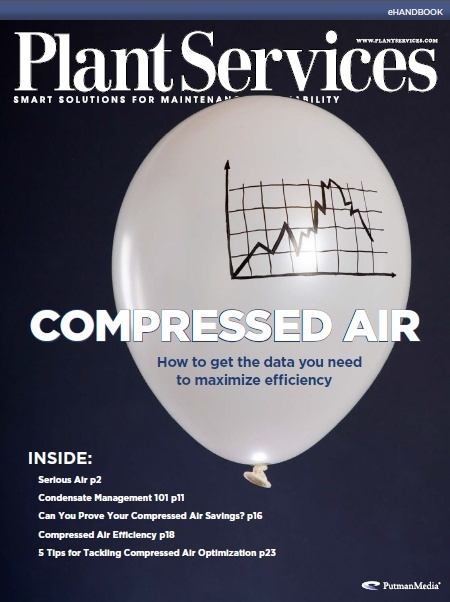 Serious Air: Plan your compressed air system for maximum efficiency and future flexibility. Condensate Management 101: Compressed air condensate is hazardous waste – here’s how to manage it safely. Can You Prove Your Compressed Air Savings? Why getting baseline readings and continuously tracking your progress is essential. Compressed Air Efficiency: How to get the most bang for your buck.